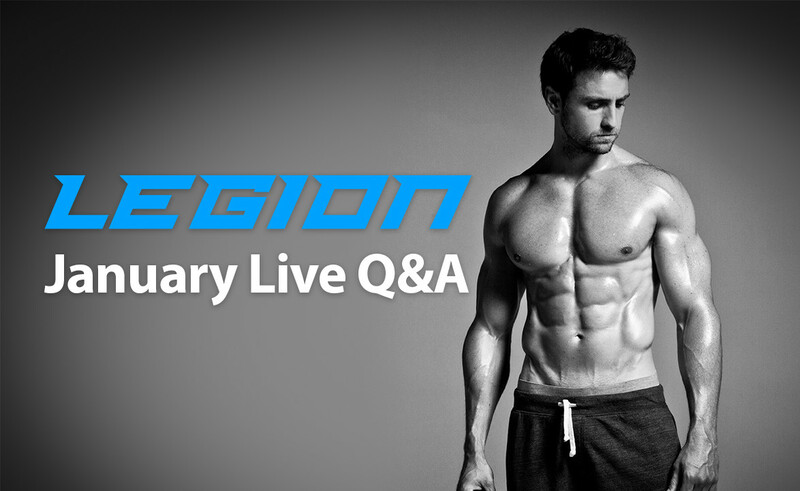 This podcast is a recording of the latest live Q&A I did over at Legion, and this time we’re talking artificial sweeteners, ephedrine, weight gainers, doing research, myofascial release, and much more. 00:38 – Is this good HIIT cardio: Incline at 7.5 with 10 mph on a treadmill for 10 minutes. 02:28 – When I take creatine monohydrate I get bad insomnia and have to pee 10 times a night. Is there a different form I can take? 04:55 – I just had surgery and was looking at your joint supplement Fortify. Could you comment on the effectiveness it might have after surgery? 07:31 – Most bodybuilders rag on the Bowflex, is there anything wrong with the actual system if someone is still doing low reps, heavy weights, proper form? 08:46 – What do you consider to be the ideal Carbs/Protein/Fat percentage when cutting for a female? 15:41 – How can I avoid forearm pain during bicep curls? 17:06 – When are you going to come to the dark side and do a powerlifting meet? 19:37 – Could you please address problems with artificial sweeteners? 22:51 – What’s the “healthiest” way to get drunk? 25:14 – Can you comment on the use of Ephedrine HCL? 26:54 – What’s your go-to method for cooking chicken? 27:37 – When carrying out research for articles, what is your go to reference for trusted information? 29:46 – Is there a certain downside to using mass gainers? 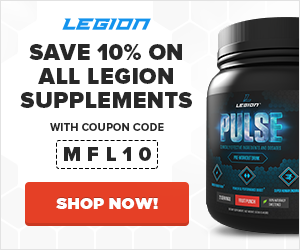 32:33 – Did you work with researchers/scientists to come up with your Legion protein? 34:30 – What’s your opinion on taking cleansing diet pills for cutting? 37:07 – What’s the ideal amount of time to fast for IF? 37:20 – Do you take into account the afterburn affect of HIIT when counting macros? 38:08 – What are your thoughts on myofascial release? 38:30 – Why wont you go vegan? 40:41 – If you could only shave one part of your body for your next photo shoot, what would it be? 41:10 – What do you think of Tim Ferriss and the whole life hack fitness industry? 42:51 – How often should macros be adjusted as you’re cutting? 43:51 – Can women follow the Beyond Bigger Leaner Stronger program? 47:06 – Can you explain some guidelines for LISS cardio instead of HIIT? 48:18 – Any news on your app (beta) release? 50:07 – What do you think of yoga for mobility? 50:42 – Can you tell us a bit more about your affiliate programs for 2016? 54:34 – What are your thoughts on the Chest Dumbbell Pullover as a chest building exercise. 55:26 – What are your thoughts on using accessories such as wrist/lift straps, belt, knee sleeves? 58:44 – Any advice for dating German girls? 59:14 – What are your current max lifts for side lateral raises, squats, deadlifts, bench and overhead press? 1:03:28 – I’m a female NPC competitor at 16 % body fat and have been working out for almost 3 years now. Any exercise that would help my quads show? 1:07:29 – Let’s say I put together a a protein bar that tastes better than Quest Bars. What is the first step to bring this product to market? 1:10:10 – Is it ALWAYS calories in vs calories out, or is it true that when people get older their metabolism lags? 1:12:13 – Why have you never been DEXA scanned? 1:15:07 – At what point in your life did you realize you wanted to start a career in the fitness industry? 1:22:08 – Is it possible for a hernia surgery to mess up the abdominal wall? 03:31 – Is this good HIIT cardio: Incline at 7.5 with 10 mph on a treadmill for 10 minutes. 06:24 – When I take creatine monohydrate I get bad insomnia and have to pee 10 times a night. Is there a different form I can take? 07:50 – I just had surgery and was looking at your joint supplement Fortify. Could you comment on the effectiveness it might have after surgery? 10:27 – Most bodybuilders rag on the Bowflex, is there anything wrong with the actual system if someone is still doing low reps, heavy weights, proper form? 11:42 – What do you consider to be the ideal Carbs/Protein/Fat percentage when cutting for a female? 18:36 – How can I avoid forearm pain during bicep curls? 20:01 – When are you going to come to the dark side and do a powerlifting meet? 22:33 – Could you please address problems with artificial sweeteners? 25:47 – What’s the “healthiest” way to get drunk? 28:10 – Can you comment on the use of Ephedrine HCL? 29:50 – What’s your go-to method for cooking chicken? 30:32 – When carrying out research for articles, what is your go to reference for trusted information? 32:42 – Is there a certain downside to using mass gainers? 35:29 – Did you work with researchers/scientists to come up with your Legion protein? 37:26 – What’s your opinion on taking cleansing diet pills for cutting? 40:03 – What’s the ideal amount of time to fast for IF? 40:16 – Do you take into account the afterburn affect of HIIT when counting macros? 41:04 – What are your thoughts on myofascial release? 41:25 – Why wont you go vegan? 43:37 – If you could only shave one part of your body for your next photo shoot, what would it be? 44:06 – What do you think of Tim Ferriss and the whole life hack fitness industry? 45:47 – How often should macros be adjusted as you’re cutting? 46:29 – Can women follow the Beyond Bigger Leaner Stronger program? 50:02 – Can you explain some guidelines for LISS cardio instead of HIIT? 51:14 – Any news on your app (beta) release? 53:03 – What do you think of yoga for mobility? 53:38 – Can you tell us a bit more about your affiliate programs for 2016? 57:30 – What are your thoughts on the Chest Dumbbell Pullover as a chest building exercise. 58:22 – What are your thoughts on using accessories such as wrist/lift straps, belt, knee sleeves? 1:01:41 – Any advice for dating German girls? 1:02:10 – What are your current max lifts for side lateral raises, squats, deadlifts, bench and overhead press? 1:06:24 – I’m a female NPC competitor at 16 % body fat and have been working out for almost 3 years now. Any exercise that would help my quads show? 1:10:25 – Let’s say I put together a a protein bar that tastes better than Quest Bars. What is the first step to bring this product to market? 1:13:06 – Is it ALWAYS calories in vs calories out, or is it true that when people get older their metabolism lags? 1:15:09 – Why have you never been DEXA scanned? 1:18:02 – At what point in your life did you realize you wanted to start a career in the fitness industry? 1:25:04 – Is it possible for a hernia surgery to mess up the abdominal wall?